Denise Rosenbloom is more than a landscape designer: She’s a bona fide environmental artisan who uses form, function and flow to reflect a home’s intrinsic nature. The owner of Botanical Concepts Chicago, Rosenbloom hasn’t always been an urban innovator. She perviously owned a clothing line and has acted as a general contractor on residential and commercial projects. “It never crossed my mind that you couldn’t be feminine and wear a hard hat,” she says. 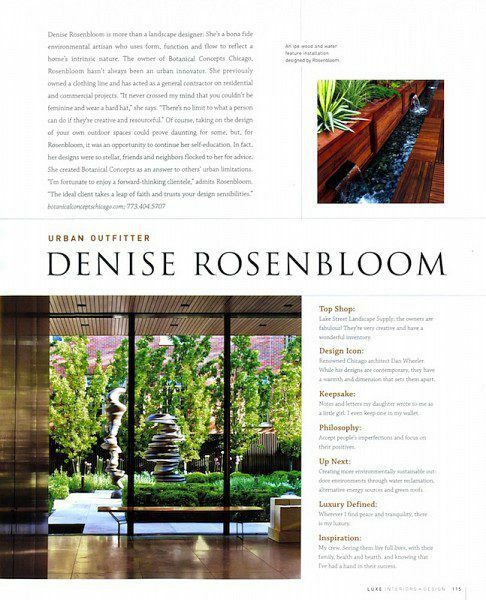 “There’s no limit to what a person can do if they’re creative and resourceful.” Of course, taking on the design of your own outdoor spaces could prove daunting for some, but, for Rosenbloom, it was an opportunity to continue her self-education. In fact, her designs were so stellar, friends and neighbors flocked to her for advice. She created Botanical Concepts as an answer to others’ urban limitations. “I’m fortunate to enjoy a forward-thinking clientele,” admits Rosenbloom. “The ideal client takes a leap of faith and trusts your design sensibilities. Lake Street Landscape Supply; the owners are fabulous! They’re very creative and have a wonderful inventory. Renowned Chicago architect Dan Wheeler. While his designs are contemporary, they have a warmth and dimension that sets them apart. Notes and letters my daughter wrote to me as a little girl. I even keep one in my wallet. Accept people’s imperfections and focus on their positives. Creating more environmentally sustainable out-door environments through water reclamation, alternative energy sources and green roofs. Wherever I find peace and tranquility, there is my luxury. My crew. Seeing them live full lives, with their family, health and hearth, and knowing that I’ve had a hand in their success.